Last fall, we had our first household initiative challenging ourselves to be strong, walk, exercise and choose active events that promote balance and dexterity. We called any activity that was more, well, active, a “Strong Choice,” and worked with our restorative nurse to plan more activities like that. As an afterthought, we decided to post a piece of paper in our dining room for each resident and nursing assistant with their name on it and a line for each day of the week. Each time a resident or nursing assistant made a “Strong Choice” they each got to put a green dot sticker on their paper. We went through lots of dots. Residents tried new activities. More open discussions began with residents about their active life. We discovered that some residents did not have as much planned restorative activity as they wanted. We learned a ton. My co-workers enjoyed seeing public evidence of their hard work with the stickers on the sheets. Open evidence of which staff had lots of dots and which had only a few dots generated good discussion. There was no prize. It was not a contest. It was just effort made visible. It took a lot of energy, and at the end of the second week we took a happy break from the dots. We had such good results that the next month Samaritan Bethany promoted this challenge throughout the building. Using the same idea, they made a contest for staff. In order to emphasize documented restorative activity, Samaritan Bethany chose only to use dots for documented restorative activities. Residents and staff in Essex House struggled with the new rules. It was as though only part of our previous efforts counted, when all of them mattered to us. With the contest, we also saw that it was possible to overemphasize the role of staff in the residents’ restorative life. We spent time thinking and talking about the difference. 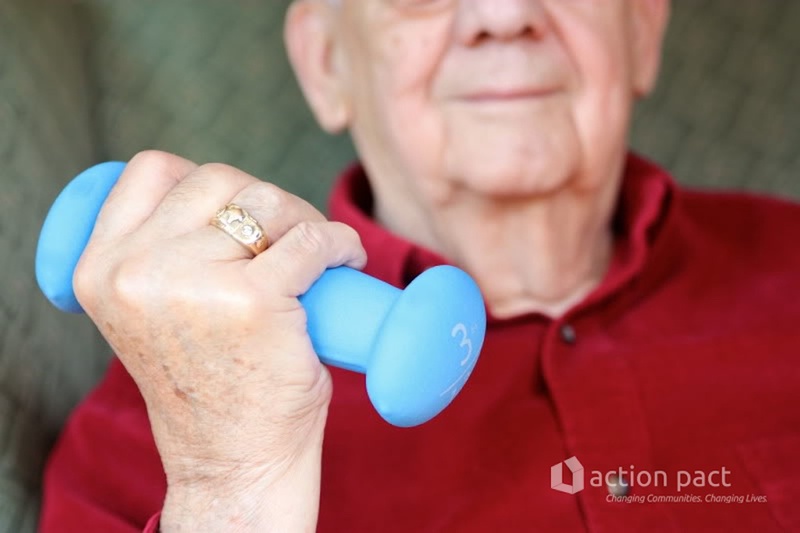 Could a strength challenge just facilitate the resident’s active life? If we are all on the same page, is it possible for us to just enable their active choices? In early March this year we began discussing a new idea for challenging ourselves to keep up our strength. We wanted to do something very different, but still keeping the best parts of our green dots challenge. With Memorial Day’s approach, an opportunity became clear. We decided that each day we would dedicate our “Strong Choices” to the memory of a loved one. Each day we put up a poster with a person’s name on it and for each “Strong Choice” instead of a green dot we would use flower stickers with our names on them. I visited with residents to ask about people they would especially like to remember on Memorial Day. When I spoke to the first resident, I reminded him of our green dot strength challenge. He told me that he knew he needed to walk more, but sometimes it was just easier to sit. I said, “We will help you. You can do it.” He was walking by that afternoon. It was his own choice to stand with his walker, rather than transfer himself into his wheelchair. Once we started walking, it was easier to understand. The poster of the day hung in our dining room, and in the morning we would read about the person we were honoring. The next morning we would look at the huge floral tribute we had created together, and hang the poster honoring another person. 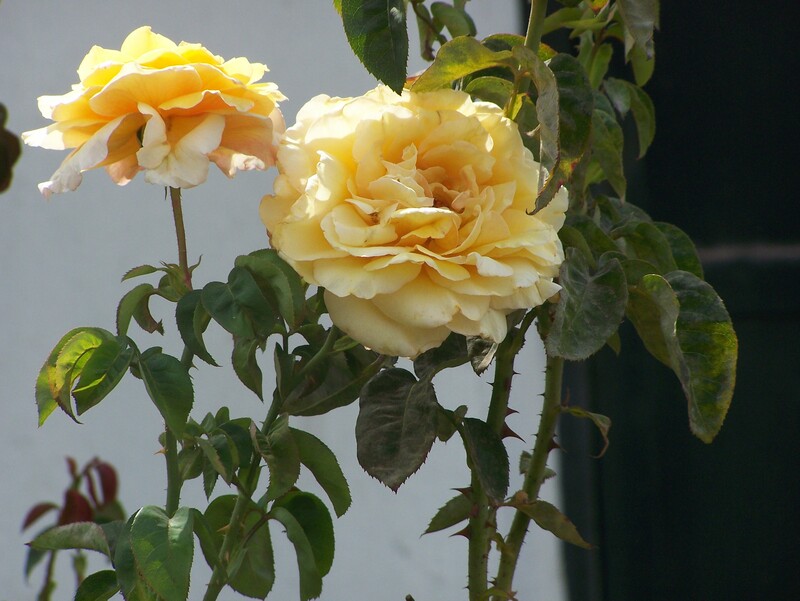 Most of our residents have those tributes to their loved ones hanging in their rooms to this day. Our memorial walks went on for six weeks as day after day we honored the loved ones of both residents and staff. What Makes a Rehab Household Different from the Traditional Short-Term Unit? It’s true. We’re not trying to create a home for people who come to us for rehab. People are with us to do the work and go home to somewhere else, not to cozy into a household. It’s a fast-paced environment with people coming to us for only a few weeks. And yet the principles of person-directed care and self-led versatile work teams are as critical in the rehab environment as they are in the long-term care environment. The following are three of the pitfalls of the institutional model in short-term rehab, and how culture change adds value for our guests. Staff members work in departmental silos and assignments may vary from day to day. CNAs, medication aides and floor nurses rarely know a guest’s rehab goals or full plan of care. Rehab therapists rarely know all the concurrent conditions that person is experiencing, how they are sleeping, or what social, emotional and spiritual needs might be impeding progress. Everybody belongs to a small-size rehab house. A permanent team is in place in each house. Everyone participates in knowing the guests and following their progress. CNAs cross-train as rehab aides, assist with assessments, follow guests into the gym, and help continue the plan of care 24 hours a day. Household teams work to understand and meet the needs of the whole person. Therapists and the rest of the team work shoulder-to-shoulder with each other and the guest as care managers. The rehab unit rarely has adequate space or hospitality for family and friends to join a guest for a meal or visit outside the guest’s bedroom. The support of family and friends is often critical to the speedy recovery of a guest, and often there has been little thought to making room for this to happen. Create space at the table for family and friends. Make 24-hour hospitality centers with coffee, juices and snacks. Build in living room spaces for gatherings outside the bedroom. Have homemakers in each rehab house who are trained as certified dietary managers and hospitality specialists. Have household coordinators who assure that a welcoming and convivial environment is maintained. Practices used for the convenience of staff often do not promote independence and recovery of function. This includes unnecessary assistance with bathing, dressing and other activities of daily living, as well as the use of wheelchairs for staff convenience to speed transport of guests. Interrupted sleep also prevents optimal recovery. This includes loud paging systems and bells, late-night treatments and medications that could be given on other shifts, third shift entry into rooms to restock supplies and clean equipment, and frequent turning on of lights to check for guest safety and feel for urinary incontinence. Exhausted guests do not do well during gym workouts! Reorganize so that administrative nurses, recreation/life enrichment staff, social workers and administrative staff spend at least part of their time attached to one house to help with household duties. They sometimes cross-train in another job to free up CNAs and nurses to take the time to allow guests to “do for themselves.” Work to eliminate the use of wheelchairs as much as possible, and reassess this on a daily basis. Eliminate all unnecessary nighttime disturbances and practices. Bev Cowdrick received her Masters in Public and Private Management from Yale and is a licensed nursing home administrator. While a consultant for Action Pact, Bev guided many nursing homes through their transformation to households. She is currently the Associate Director at Glenaire, a continuing care retirement community in North Carolina.